Would you say you’re a grateful person? What does it mean to be grateful? To not only be grateful in theory, but in practise as well? Let’s start with what gratitude actually means, being the quality of being thankful; readiness to show appreciation for and to return kindness. That is, by showing thankfulness, showing appreciation and recognising the good in our lives it will result in being a grateful person, thereby leading to a happier and healthier life. Practising gratitude is not hard, or time consuming. It’s just that we’re programmed to look at the negatives, obsess on the little things and focus on OUR picture, not the big picture. Expressing gratitude changes this. You connect with yourself, you connect with others and you connect with the ‘bigger picture’, whatever that may be. 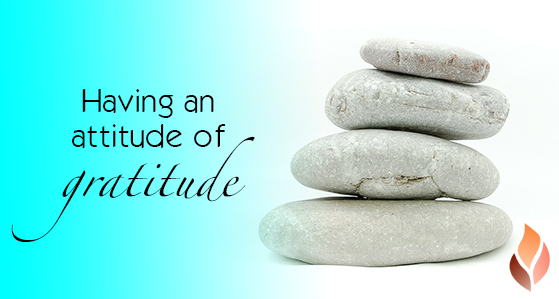 Some people apply gratitude to their past – positive memories and thankful opportunities. Others choose to apply gratitude in the present – living in the moment and ceasing opportunities. Then others apply gratitude to the future – remaining hopeful and optimistic. So how do you turn your theory on gratitude into practise? Share, share, share – if you’re grateful for something, share it. If you’re grateful for someone, tell them. Recognise yourself, your experiences, your family and your friends. Practise gratitude, you’ll be thankful you did.